1. With your chosen First Edition Travel Notes Paper, cut a piece to 12.3 cm x 17.3cm and stick to the front of the card blank using double sided tape. 2. To create the pocket for your card, use a contrasting piece of paper and cut it to 9.4cm x 10.2cm. Diagonally cut the bottom of the paper to make the pocket design. 3. Print the free vouchers sheet from our Handmade Father’s Day Wallet Tutorial onto card and cut one out to size before sticking at an angle, tucking one corner into the pocket. We have then cut the ‘Happy Father’s Day’ voucher and added this to the centre of the pocket. We have used 3D foam pads to add some height to the card. 4. To finish, use a pen to add faux stitching around the edge of the card and the pocket. 1. Cut a piece of the First Edition Travel Notes paper to 17.5 cm x 12.5cm and stick onto the card blank. Layer on top with a contrasting piece of paper which had been cut to 11.5cm x 16.7cm. 2. Make a flag design by cutting a piece of paper to 15cm x 10 cm and cutting one end diagonally to create a V-shape. We have also created a flag design with a different paper sheet which has been to 14cm x 9.1cm. Layer onto of the larger flag design and stick to the card blank. 3. We have then die cut the arrow patterned paper, with the third largest nesting die stamp and added it to the card using foam pads. 4. Die cut the bowler hat, glasses and moustache from the First Edition Gentlemen die set, using black and cream textured card stock and stick on top of the arrow paper. 5. 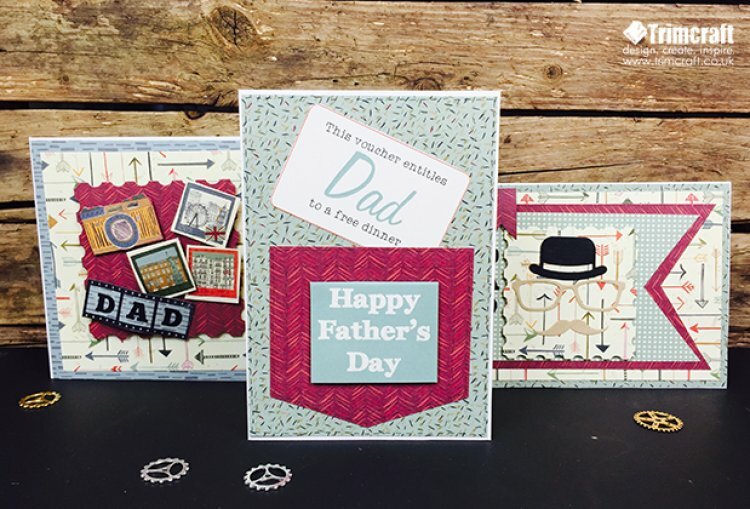 With black textured card stock, die cut the word ‘DAD’ and stick down the side of the card. 6. To coordinate with the flag designs already on the card, we have also cut a 1.8cm x 3.2cm small flag and added to the top left of the card using foam pads. 1. Cut a piece of patterned paper to 14.9cm x 15cm and stick to the card blank. 2. We have then used the arrow repeat paper cut to 13.6cm x 13.7cm and added to the centre of the card using double sided tape. 3. Die cut the second largest stamp with a contrasting paper and stick it to the centre of the card using foam pads. 4. To decorate the card, cut out one of the cameras from the First Edition Travel Notes paper pad and stick to the top left of the stamp die cut. Add three cut out Polaroid images from the same pad and stick them at an angle using foam pads onto the die cut shape. 5. To finish, we have stamped the Dovecraft filmstrip clear stamp onto the grey dashed paper and cut to size. Whilst this is drying, die cut the letters ‘DAD’ using black textured card stock. Glue the letters onto the stamped paper once the ink has dried. 6. Wrap the paper featuring the film reel stamp around your pencil to add shape. Add the filmstrip to bottom left of the centrepiece with a folded piece of foam tape underneath to give the paper dimension in the middle. Show us what you have made for your Dad in the Project Gallery, where there is plenty more inspiration to inspire you.